If you're number one you must be doing something right. Well, Vuelta is doing a lot of things right with its Starlite wheelsets, both for road and mountain bikes. packaging that can be hung or set on the showroom floor for easy customer inspection and purchase. "Bike store owners asked us to design a high-quality aftermarket wheelset with a Shimano hub," says Tom Curran of Vuelta. "We developed the StarLite and IBDs are selling the wheels almost as fast as they are being built. We couldn't be happier with the wheelset's performance both on consumer's bikes and in the stores." Vuelta also produces high-end and value-priced wheelsets for both road and mountain bikes including the Vuelta Carbon Pro WR which Ondrej Sosenka raced to set the World's Hour Record. In addition to the Carbon Pro WR, Vuelta's road line-up includes wheelsets for both tubular and clincher tires and in carbon and steel alloy. All clincher wheelsets come wrapped in Michelin tires. Vuelta's mountain bike products feature rims in carbon or alloy steel, and all mountain bike wheelsets come complete with Michelin tires already installed. Vuelta wheels are distributed in the North America by Action, BTI, Fuji America, Hans Johnsen Co., Hawley, KHS, Lexco, Mel Pinto Imports, UBP, Wilson Sales and ACS Distribution (Canada). 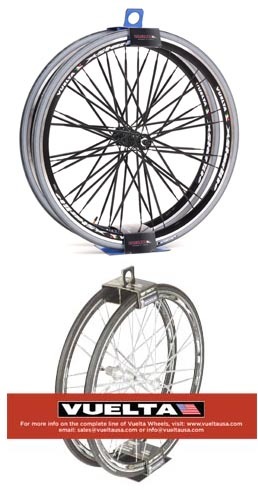 Vuelta wheels are designed and produced in Italy using only the highest grade materials. For more information log onto the internet at www.vueltausa.com or call toll-free 1-866-488-3582.